Your life, you can bring it with you! ♥ Note - Please open the battery back and remove the insulate tab before using, or the fan won't work. 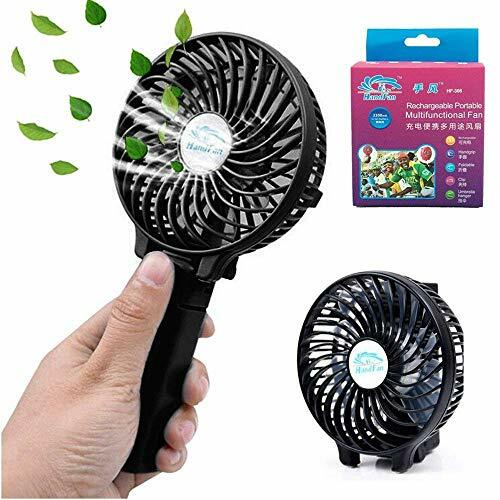 Indoor Mini Fans: Clip on the table or fold the handle, put the fan stand on your desk, enjoy your working or leisure time in office, bedroom, living room, etc. running, travelling, hiking, climbing, camping, exercising or enjoy exciting moments like sports meeting, basketball and football game. ♥ Folding Handle Compact Size - 103*205*28 mm (4*8*0.7 inch), portability, handy, lightweight, 180° foldable handle, perfect for men, women, ladies, kids and baby, can stand on your desk or table and easy storage in purses, briefcases, backpacks, luggage, car and more! If you have any questions about this product by Kingcenton, contact us by completing and submitting the form below. If you are looking for a specif part number, please include it with your message.